Pictures captured the moment a large Siberian tiger attacked a zookeeper in a Russian zoo. According to The Sun, a keeper at the Kaliningrad Zoo had food for the tiger when it attacked her on Sunday. The pictures show Taifun, the tiger, on top of the woman, who is screaming. Onlookers helped save the zookeeper by shouting, the zoo said in a statement. They also threw stones and benches and tables from a cafe at the beast. The zookeeper was then able to go hide in an “inner room” in the enclosure, the statement said. “The patient was delivered to the hospital with multiple wounds to the body and limbs,” said a local Health Ministry spokesman, The Sun reported. The zookeeper, who was not identified, was not critically injured. The zoo said her injuries are nonlife-threatening, and her condition is stable. “Until today, he did not show aggression toward employees,” the zoo said, adding it is the first tiger attack in the 120-year history of the Kaliningrad Zoo. 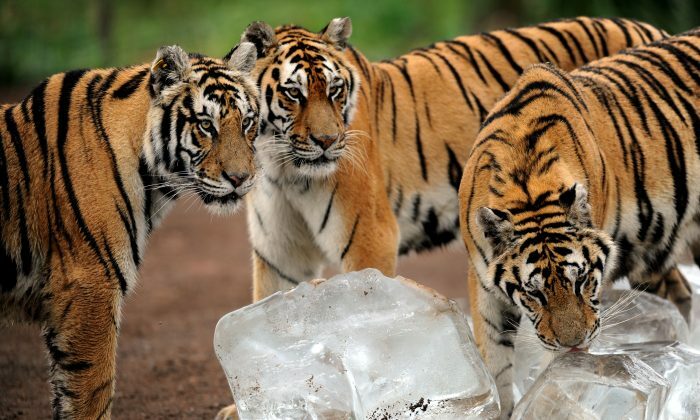 Siberian tigers are the largest big cats in the world. They can weight up to 800 pounds.